lost in transition: (Mis)adventures in Basque Lands: a 154 kilometer misadventure. (Mis)adventures in Basque Lands: a 154 kilometer misadventure. I usually like to wait to write my race reports so the events of the day can really sink in. This race, however, is one I just want to let go. So here goes....raw, unedited. 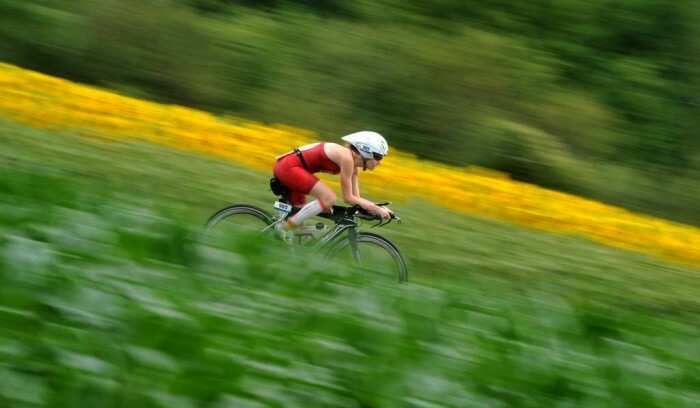 Racing triathlons is equal part training and luck. Control what you can control, and accept that there will be many things that you cannot control. 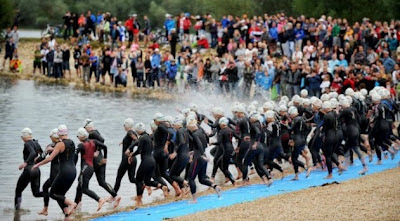 Today I raced the ITU long course world championship in Vitoria-Gasteiz, Spain. With a 4k swim, 120k bike and 30k run, the distance was not one I am familiar with, and to be honest, did not play to my strengths at all. As a weak swimmer, I need a proportionately longer bike ride and run to be competitive. And let's be honest. 4k is a frighteningly long, long way to swim. But it was not the long swim that was my undoing. Quite the contrary, I was quite content with my swim split. Despite some sighting issues and some age-group chaos when our wave caught up to the men in front, I managed to catch a group of swimmers for the second half of the swim and stick with them. 4k in under 1:15. I'll take it. Women 18-39 wave start. I'm 7th from the left! The bike course in one word: stunning. Incredible Basque country-side, fully closed course and great crowd support. There was one section that was full of sunflowers in bloom, another with sweeping views of the countryside. The bike course was also extremely fast, and I split 3:19 and change (that's 36kph). Second fastest in my AG and as good as many of the pro women. Pleased as punch with that....but the unraveling was already well on its way. The uncontrollable was the horrible side stitch that started halfway through the swim, spread during the ride and rendered me immobile by the time I arrived in T2. Riding with a stitch is one thing, but running with one is another. I spent four minutes in T2 trying to put my runners on because I simply could not bend over, and started out the run bent over in excruciating pain. I ran the first few kilometers in tears. Every step felt like it was driving multiple knives into my ribs, and I helplessly watched the women I had worked so hard to stay ahead of on the bike stream past me. The first 10k took me nearly an hour to complete. And running is supposed to be my thing. I breathed, listening to the sound of my breath in, and out, trying to will the pain away. The mental battle I waged for 30 kilometers was all about breathing. Run, breathe, walk, breathe. Count to 10. Remember to breathe. Repeat. Distract, distract, distract. The mind is truly a powerful thing. By the third lap (there were four in total), I was in so much pain that it transcended any feeling whatsoever. My legs were fine, no GI issues, but every muscle in my abdomen felt like it was being seared. I wanted to quit every single step, but my heart told me that quitting was simply not an option. I am incredible fortunate to be in good health, to be able to race and to be given the opportunity to be at an event like this....so I could damned well be mentally strong and finish, even if it took me hours. 2nd place in my AG was my dream to chase, and lose. And that I did. All I had to do was run like I am capable of doing on any other day...but unfortunately, running like I can was simply not available to me today. And while I failed in my goal of reaching the podium at Worlds, I feel accomplishment in simply refusing to quit. I chose intention and sheer will every step of that 30 kilometers. Big hugs and thanks to all the Team Canada racers and supporters out there. In particular, Joyce and Dave, our managers, were steadfast in their support and encouragement. You're awesome! Paula Radcliffe, the world record holder in the women's marathon, withdrew from the London Olympics yesterday. Her statement spoke volumes to me. "My sport is a beautiful sport, it gives so much fun and enjoyment, I believe it helps me to be a better person and I have been very fortunate to experience some great success and have so many beautiful and happy memories. However, the downside is that it can break your heart and spirit many times over when your body is simply unable to match what your heart and brain want it to do. Sadly mine is not a career or a hobby where mind over matter can work when your body is hurt, nor where giving less than your best each day can ever work. No one tells us in advance where the limits of our own bodies lie, and pushing these limits is the only way we can ever achieve our highest goals and dreams."